Issued in 1793 in LATTRE's PETIT ATLAS MODERNE. Compiled by BONNE and JANVIER. 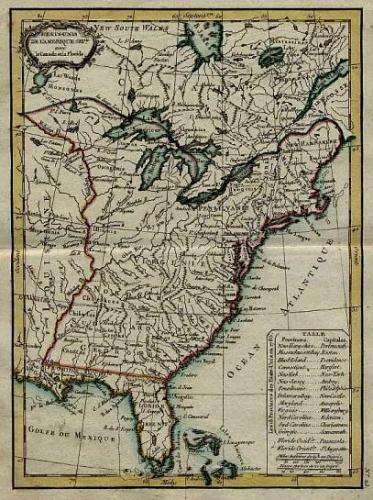 An 18th century French map that gives an early view of the 13 'provinces' of the recently created United States. Florida and Louisiana remain outside the Union. The map has original hand coloring (outline and wash colour for the coastal shore and the border). There is a decorative cartouche and a side table names the various provinces and their capital cities. The map has a centrefold as issued and is in very good condition.